Someone doesn’t want Zack to learn the truth of his father’s past. When he arrives to talk to one of his father’s partners, he finds the man assaulted and on the floor of his apartment. Another partner is gunned down after meeting with Zack. Zack suspects the corruption his father was investigating may reach as high as the New York City Police Commissioner. Or maybe even higher? Zack’s long-time friend, Shelia O'Donnell, is visiting New York from her home in Ireland. Shelia accompanies Zack to see the leader of the New York organized crime family, who may be able to provide information about his father. But can he trust a “Godfather”? Laura Kelly is caught up in an hijacking aboard the Staten Island Ferry. Meanwhile Zack’s partner, Lieutenant Colonel Rene Garcia, uncovers a plot by a group of ex-military called the Forgotten Warriors to take over the Alamo in San Antonio. Zack suspects these two events are connected and to find the solution, he’ll have to take the longest walk of his life. And it may not even lead him home. LONG WALK HOME won Runner-up for General Fiction at the 2018 Southeast Book Festival! 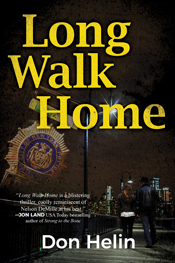 "LONG WALK HOME is a bruising and blistering thriller, coolly reminiscent of Nelson DeMille at his best. Don Helin's emotionally-wrought, angst-riddled, morality play is ever true to its title, making it a wondrous and tortuous tale of one man's descent to hell and heroic climb out of it. A mystery of rare depth, pathos, and conviction."